Our site was down for a bit over 24 hours. The problem proved to be a single port on a server switch, but it was a very important little port . . . and Jimmie was out of town, and attempts to troubleshoot remotely were not successful . . . We are, in theory, back now, and return you to the regularly scheduled Daily Illuminator, complete with picture of shiny dice. They say a picture is worth a thousand words, so I'm not even going to attempt to do this image justice. Just click on the little thumbnail, and take a look at these beautiful dice in larger-than-life detail. 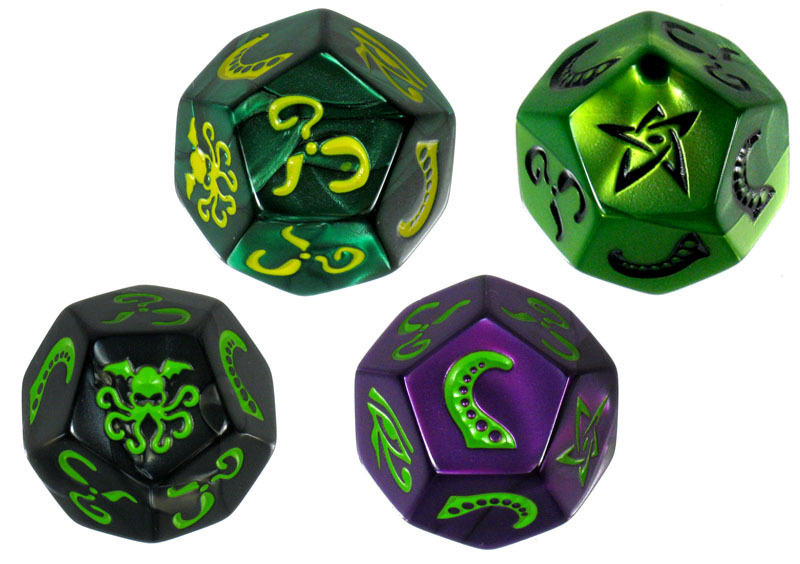 You're looking at printer samples of Cthulhu Dice, which is scheduled to ship early next year. Each game will include one of these four colors. Don't worry, the colors will not be random -- each case will have the same number of each and the packaging will NOT be blind. You think we're going to make something this beautiful and not have it show in the package?